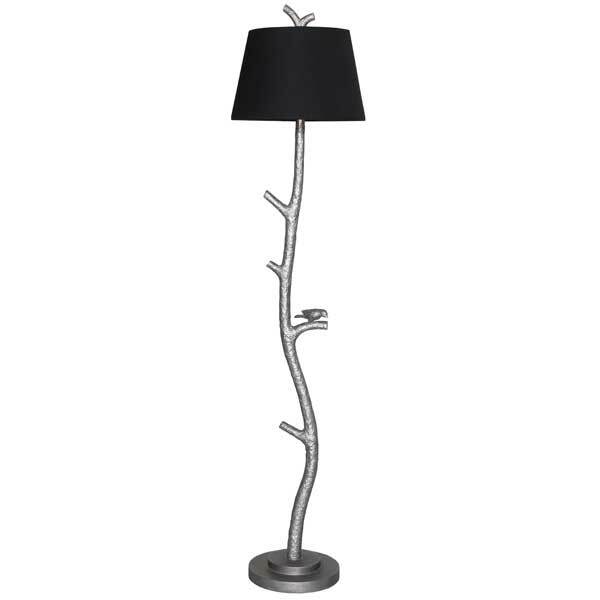 twig floor lamp.custom floor lamp.custom furniture.giacometti lamp. The Twig Floor Lamp with Bird Detail was inspired by the work of Diego Giacometti (1902-1985), who was a Swiss sculptor and designer, and the younger brother of sculptor Alberto Giacometti. After business studies in Basel and Saint-Gall, he followed the advice of his mother Annetta and went to Paris to rejoin his brother Alberto, then a student of the sculptor Antoine Bourdelle at the Academy of the Grande Chaumière. The working relationship of Diego with Alberto was so close that it was sometimes difficult to distinguish the work of Diego from that of Alberto. The metal surface of this lamp is beautifully textured as though it was fashioned by a sculptor. Such surface texture was widely used by Diego Giacometti on his furniture and lighting creations. He often used to adorn his pieces with little animal sculptures. The bird accent on this lamp is a tribute to Diego. With its European style whimsical elegance, this unique lamp may be used in eclectic residential or hospitality interiors. It is offered in a variety of exotic hand-applied finishes. A unique feature of this lamp is a medium-base socket with a built-in dimmer switch, allowing the light intensity to be adjusted with ease. The lamp comes with an off-white hand-made fabric shade. Other shade colors are available by special order. The Twig Floor Lamp with Bird Detail was designed by Shah Gilani, ASFD. Custom sizing is available. In addition to our standard product, we specialize in designing and manufacturing according to the client’s unique requirements. Drawings are made and finish samples prepared for client approval. We welcome international orders. Our shipping department can arrange customs clearance and convenient delivery to the customer’s door anywhere in the world.